Beautiful Brentwood-Darlington area contemporary designed home with floor to wall windows and a perfect open floor plan! Kitchen has beautiful quartz counter tops with stainless steel appliances. Gorgeous hardwood floors finish off the the main level living room, dining room and kitchen. Upstairs you'll find a huge master suite with a beautiful en-suite. Two more bedrooms, full bath and laundry room finish off the second floor. This home is just a few steps away from Clatsop Park. Available for move in starting 4/16! Come see this jewel today! Gorgeous home with open floor plan has everything you could possibly want! (Updated photo's coming soon!) This home welcomes you in with its beautiful cherry hardwood floors. French door office on main floor then down the entry hall to the wonderful open great room with dining room & kitchen. The kitchen has granite countertops, gas oven/stove, stainless steel appliances and loads of cabinet storage space. Upstairs you'll find a large master with en-suite with soaker tub, double shower and a closet dreams are made of! Additionally there are two more generous sized bedrooms with huge closets and full hall bath. The upstairs bonus room could be used as an additional bedroom. This wonderful home is in a quiet neighborhood & looks out to open space with a private back yard. It's a short walk or jog to Dogwood Park just a couple of blocks away. Minutes to I205. Don't miss this little slice of heaven! Available for move in starting 4/16! Contact our leasing agent for more information! This home offers privacy with over 1 acre that backs to a greenbelt and has a wonderful garden area! The home has wonderful high ceilings that creates a grand entrance! Wonderful open kitchen with stainless steel appliances a tons of natural light. You'll find an office and master bedroom on the main floor. Upstairs you'll find two more bedrooms plus an office nook at top of stairs and HUGE bonus room! Plenty of RV parking. Don't miss this gem! Available for move in starting 4/29! See yourself coming home to this gorgeous 3 bedroom 2.5 bathroom home! This bright and spacious home features a spacious kitchen fit for entertaining or relaxing in the bright, spacious living room. Spend those cool winter nights inside by the cozy fireplace or enjoy those warm summer nights outside on the patio! Make this home yours today. Contact our leasing agent for more information! This home is professionally managed by Pathlight Property Management, the exclusive property manager for Home Partners of America, offering excellent customer service, 24/7 emergency maintenance service, online application and payments, and pet-friendly options. HOA occupancy restrictions may apply. ALERT: If you see an ad for this home on Craigslist, please notify our office. We do not advertise any of our homes on Craigslist and it is likely fraud. Sweet one level home with 3 bedrooms and 2 bath on a corner lot! Wonderful high ceilings and bay window in the living space. Kitchen has great open feel with island. This home is in the perfect location with Portland only 17 minutes away and a 7 minute drive to I-205. The Community Village Shopping center is a short 7 minutes away. Don't miss this gem! Available for move in starting 5/12! Wonderful almost new bright & light filled home in quiet Summer Falls neighborhood. The home has beautiful wood floors on the main! With four bedroom and 2 1/2 bathrooms there is lots of space for everyone! Open concept kitchen with light-filled great room is perfect for entertaining. Laundry is upstairs for convenience. Wonderful private deck off dining room. Just a quick drive to Murray Hills for easy shopping & dining. Available for move in starting 5/14! 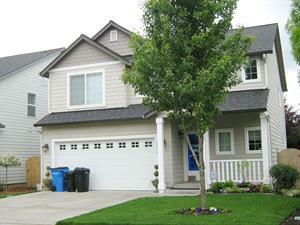 Wonderful well cared for home in the top rated Camas School district! This wonderful 4 bedroom 3 1/2 bath home has one of the most popular designs in the area! The main floor bedroom features a kitchenette and en-suite bathroom that could be the perfect nanny suite or guest room. The kitchen is large and spacious with granite countertops and gas cooktop that opens to the dining and great room. Upstairs you will find the master bedroom, two additional bedrooms, an office, loft space and full hall bathroom. Easy walk to schools, swimming and kayaking on Lacamas Lake! Available for move in starting 5/16! Don't miss this hard to find 5 bedroom home located in Horse Thief Canyon! This home has a formal living and dining room with spacious kitchen that opens to the nook & family room. There is a bedroom and full bath on the main floor, just perfect for guests! Upstairs you'll find the master bedroom with en-suite and three more generous sized additional bedrooms and a not to be missed 19x15 bonus room! Don't miss this wonderful house just waiting for you to call it home! Available for move in starting 5/16! Wonderful charming Battleground home just waiting for you. This home features a formal living and dining room as well as a spacious kitchen with eat at bar that opens to the nook and family room. Upstairs you'll find a vaulted master bedroom with en suite & two closets. There are three more additional bedrooms upstairs with full hall bathroom. The laundry room is conveniently located upstairs as well. With a three car garage there is plenty of space for everything. This home has a great location being close to schools and the shopping, don't miss it! Available for move in starting 5/16! Make yourself at home at this charming 3 bedroom 2.5 bathroom home located in Vancouver! This spacious home features a welcoming kitchen that opens to the bright and spacious living room. Don't miss this opportunity to make this home yours. Contact our leasing agent for more information!